Back in July, I was fortunate enough to attend the first meeting of pointypo, a Paris-based group of letterers and type designers who gather monthly, enjoy a beverage together, and share their work. The tone of the meeting was ideal: no nonsense, no pretence, no egos - just a welcoming space for designers, artists, letterers & printers to gather, meet, show, tell, critique, learn & grow. The whole experience was incredibly inspiring. 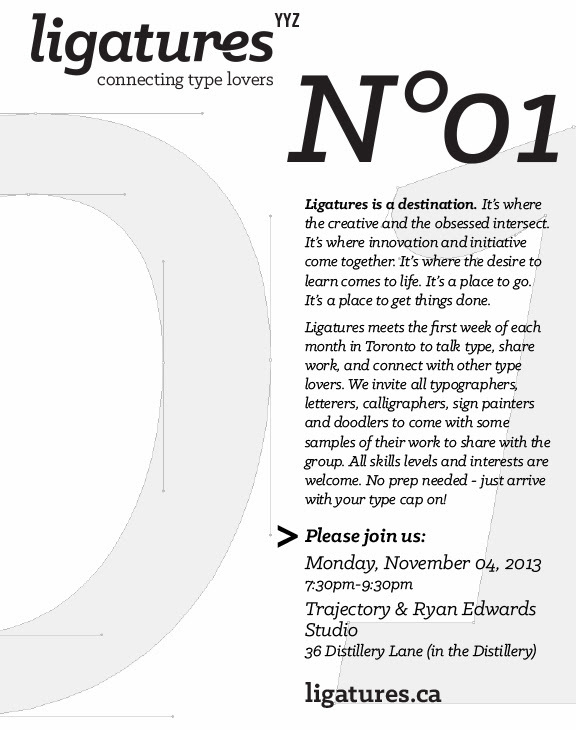 I met with two very talented friends – Kyle & Leslie – back in August to discuss the idea of a new type appreciation group in Toronto. They were both very enthusiastic about starting up something like this in Toronto. 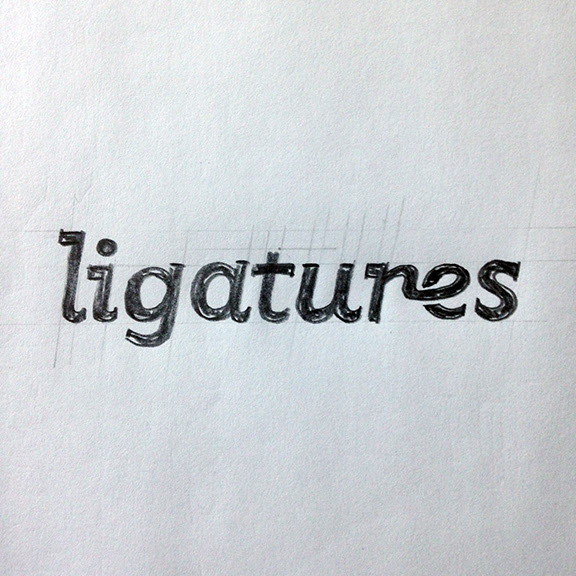 And this is how Ligatures was born. Ligatures is a destination. 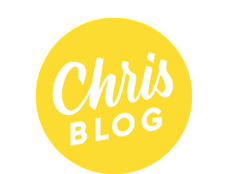 It’s where the creative and the obsessed intersect. It’s where innovation and initiative come together. It’s where the desire to learn comes to life. 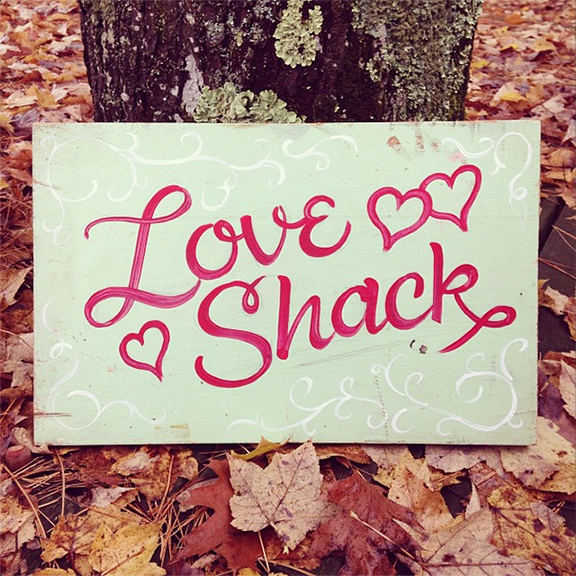 It’s a place to go. It’s a place to get things done. Ligatures welcomes you to a space for typographic-obsessed individuals whose devotion to all-things-type knows no bounds. Graphic designers, type designers and type lovers are invited to join our creative forum to discuss their work and receive feedback from their peers. 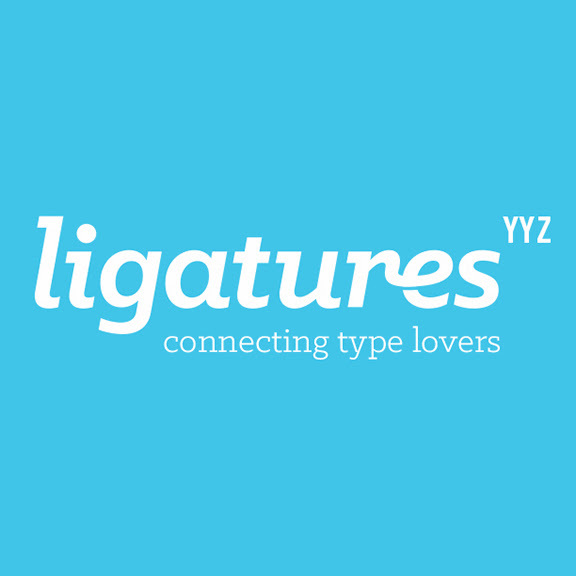 Ligatures is built on creating a sense of community amongst its YYZ creatives through the sharing of information and resources. Embracing the art of conversation, Ligatures members meet in Toronto each month to discuss current projects, and have an opportunity to ‘show & tell’ their work. All skills levels and interests are welcome. Space is limited, so please contact us if you're interested in attending. Let's get this party started! 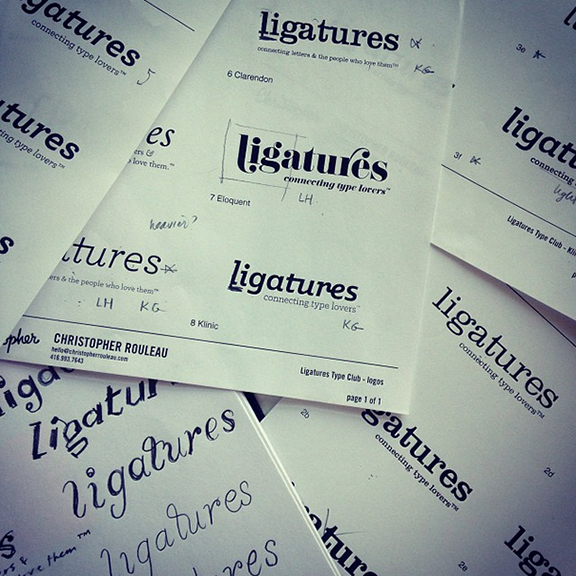 Check out our website, and please follow us on Facebook, Twitter & Instagram for all the latest Ligatures developments. 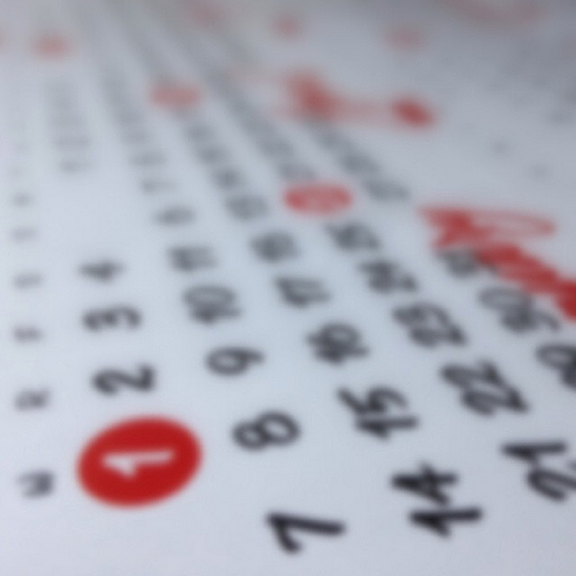 We have lots of awesome stuff planned for the coming months, so please stay tuned! 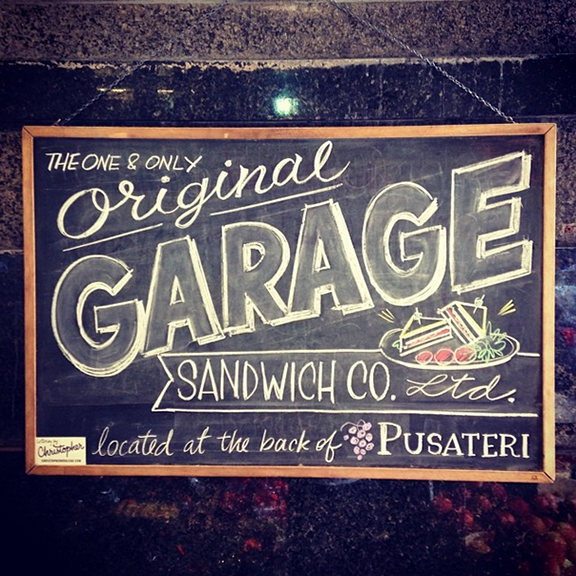 And if you're in Toronto, use the hashtag #ligaturesyyz to share all of your typographic finds, including interesting YYZ signage, lettering, and of course, your own work. 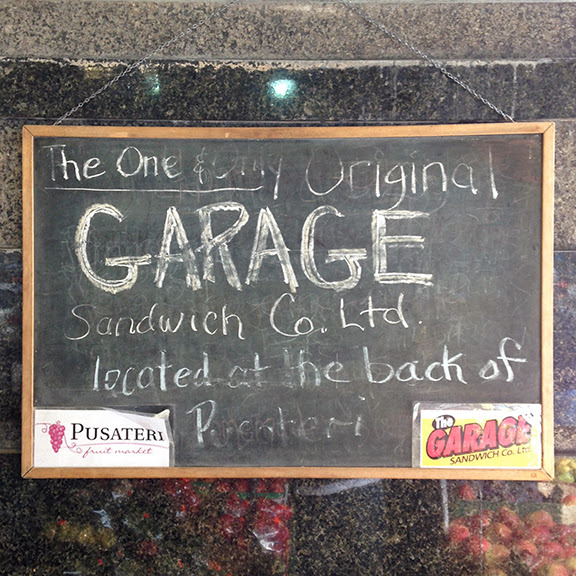 Pusateri Fruit Market had been providing the best, freshest fruit, produce and groceries in Toronto's Church-Wellesley Village since 1966. 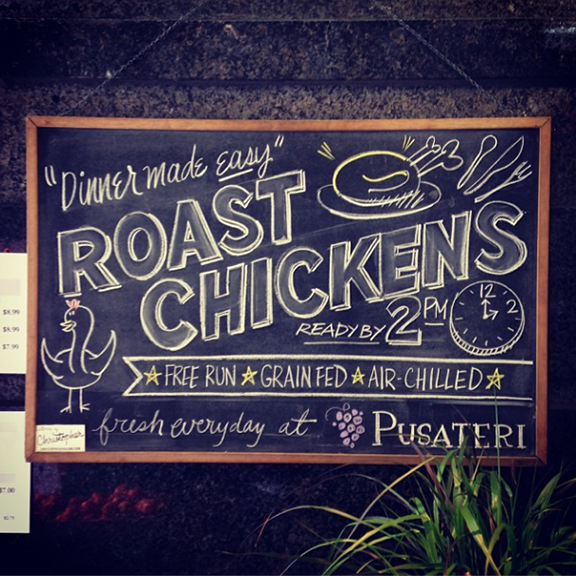 When I stopped by last week to pick up some vegetables for dinner, I looked at their 2 outdoor chalkboard displays and thought, "I think we can do better." I prepared some rough sketches, presented them to management on Friday morning, and offered to give their blackboards a makeover that afternoon. Below are the results. 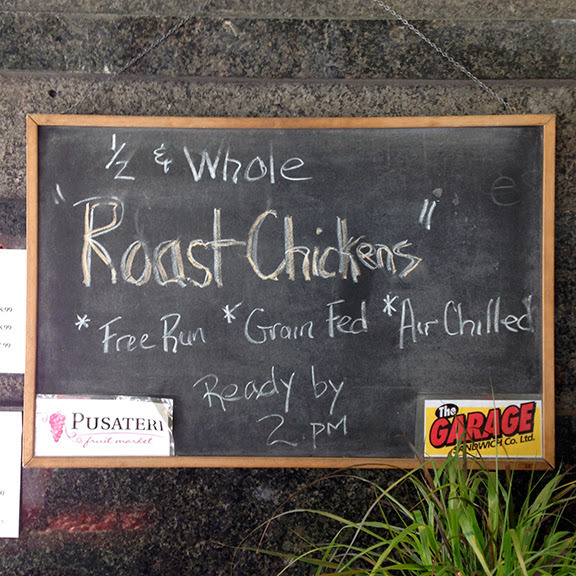 If you're near Church Street, please stop by Pusateri, check out the chalkboards, and pick up some fresh groceries . Let's all do our part to support local businesses! Here's a sneak peek at the calendar layouts that will be arriving in my shop in the next couple weeks. Please email me to reserve your limited edition copy! 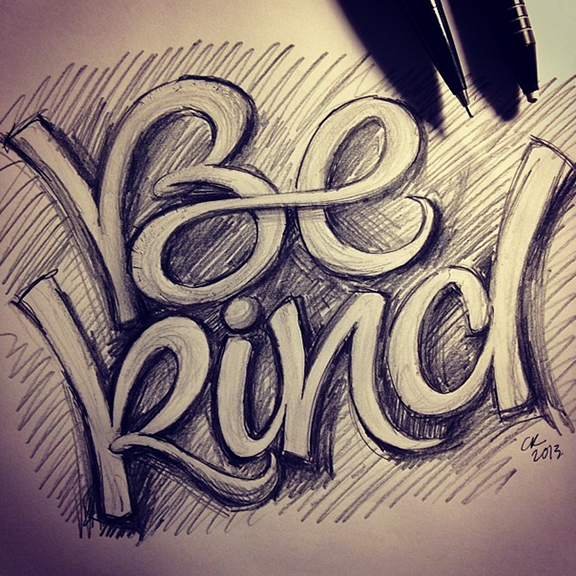 2014 is fast approaching, and so is the end of my 12 in 13 for 14 calendar lettering project. In order to send the calendar to press before the holidays, I need to finalize the layouts and send the files to press ASAP. 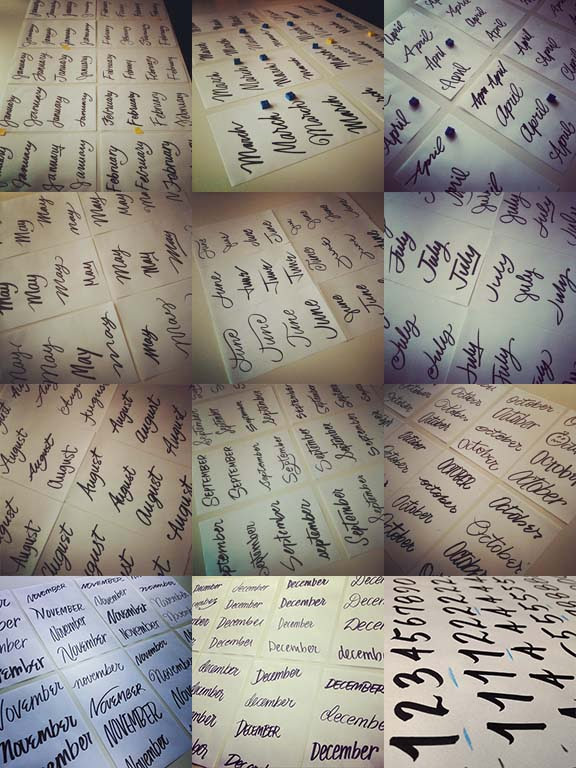 If you're following me on Instagram, you've seen that I have prepped all of the numerals and letters of the week. It's so exciting to see it all coming together! All I need now is your votes. Please take a moment and choose your favourites for November and December. And if you haven't voted for the other months, now is the time! The deadline for voting is Friday, October 18. Thanks in advance! And happy Thanksgiving to all my Canadian friends and family. 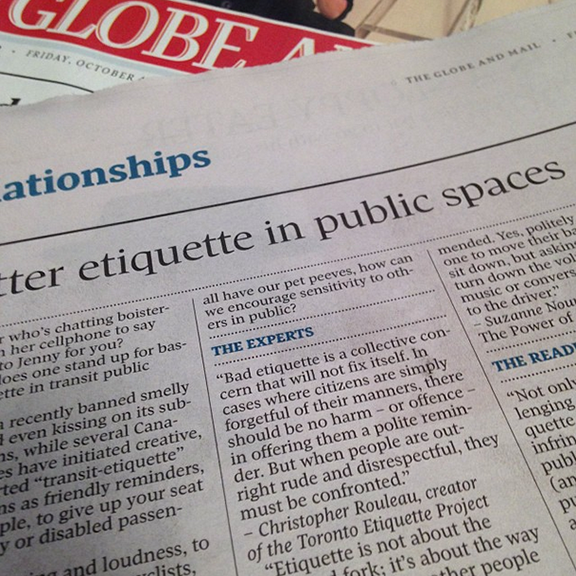 A couple weeks ago, I was contacted by a researcher at the Globe & Mail newspaper about an upcoming article on better etiquette in public spaces. The piece was published online on Friday, September 27, then subsequently published in print this past Friday. Read the full discussion here. Thanks to Ed for making this happen! 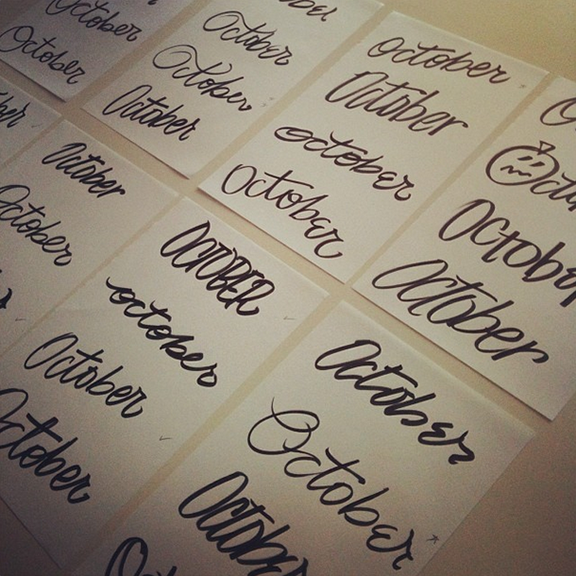 October 1 is here, and it's time for vote for your favourite lettering options over at 12 in 13 for 14! Please pop on over and cast your votes. And don't forgot to vote for January to September if you haven't already. November and December options will be posted later this month so the calendar can go into production in early November and be released in time for the holidays. Exciting!